House Republicans have been cheering on the lawsuit currently before the Supreme Court that, if successful, would cut off Affordable Care Act tax credits to more than 6 million people. Now a new report suggests the impact would fall disproportionately on their own constituents, rather than those in Democratic districts -- by a margin of 2-to-1. The research comes from FamiliesUSA, an advocacy and consumer support organization that is among the Affordable Care Act's loudest champions. The report's subject is the potential geographic impact of King v. Burwell, the lawsuit that the court heard in March and on which it is likely to rule by the end of the month. 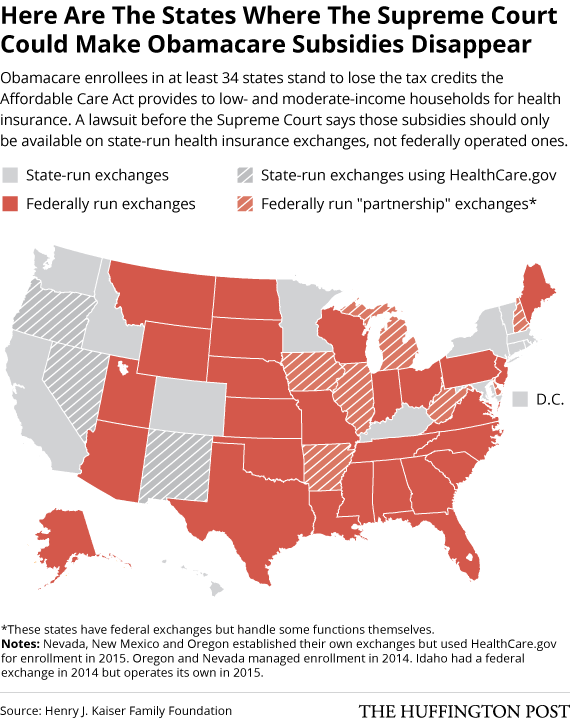 At issue in the case is whether health insurance tax credits should be available in all states, or only in those where officials decided to operate their own marketplaces, or "exchanges," for purchasing coverage. In two-thirds of the states, including Florida and Texas, officials declined to do that, leaving management of the exchanges to the federal government. It's anybody's guess how the justices will rule. But if they side with the plaintiffs, most of the people who now receive tax credits in those states would have no way to pay for their coverage, a historic decline in the number of uninsured would reverse, and the loss of so many customers would likely force insurers to raise premiums. The disruption would likely prompt a huge political fight over how, if at all, lawmakers should respond. President Barack Obama has already indicated that he'd push Congress to pass a one-sentence bill to clarify that tax credits should be available in all states, so that the money can keep flowing. House Republicans have said no way -- that at most they might pass some kind of temporary assistance, but only in return for drastic changes to the rest of the health care law. The outcome of that debate would depend to some degree on what kind of pressure members of Congress feel from their constituents. And that's where the FamiliesUSA report offers new insights. Using Affordable Care Act enrollment data from the Department of Health and Human Services, the organization has estimated the number of people in each congressional district who would lose their tax credits from a court decision against the law. The organization began releasing its data in batches Tuesday, starting with the southeast states. But at the request of The Huffington Post, researchers at FamiliesUSA also tallied up the numbers nationally and divided them by partisan affiliation. The results? Some 4.2 million of those who would lose tax credits live in congressional districts with Republican representatives, the FamiliesUSA researchers said. Just 2.1 million live in Democratic districts. It's not at all surprising that Republican districts would have more affected people, since the states where officials wanted nothing to do with Obamacare tend to have more conservative voters. Those are also the states where Republican lawmakers have been able to draw district lines in ways that boost their numbers in Congress. But the ratio of Republican to Democratic voters in these states isn't anywhere near 2-to-1. In the 2012 presidential election, for example, Republican nominee Mitt Romney got 44 million votes in these states, compared to Obama's 41 million votes. Whether people affected by a ruling would actually blame their members of Congress is, obviously, an entirely different question. Smart observers, such as New Yorker legal writer Jeffrey Toobin, have argued that "the political pain will fall almost exclusively on the President and his Party" because, ultimately, the health care law is theirs -- a point Republicans are already emphasizing. Supporters of the lawsuit also note that a ruling in their favor would mean many more people are exempt from the individual mandate, the requirement that people pay a fine if they decline to purchase insurance. But polling suggests the vast majority of people support the law's features, such as "guaranteed issue" for people with pre-existing conditions, which is enabled by the individual mandate. Polling also shows that strong majorities of people who actually have insurance through the ACA like it. In a potential showdown with Congress, Obama would promote his simple, one-sentence fix, while reminding voters that it was Republican appointees on the court who have taken away the tax credits (as it almost certainly would be) because of a lawsuit promoted by Republicans and their supporters. That may explain why some Republican lawmakers are stressing their desire to find some way of keeping the tax credits flowing, at least for a little while. According to the FamiliesUSA report, the two congressional districts with the most people who could lose subsidies are both in southern Florida. Their representatives in Congress are the Republicans Mario Diaz-Balart (with an estimated 91,000 affected people in his district) and Ileana Ros-Lehtinen (with an estimated 86,000 affected people in hers). The two veteran lawmakers have consistently supported repeal of the Affordable Care Act. When contacted by The Huffington Post for comment Tuesday, their offices replied with a joint statement: "We are working on legislation that will serve as a transition, allowing individuals to keep their premiums while House Republicans work on a solution to a possible adverse King v. Burwell ruling. We are also working with the jurisdiction on a long-term fix to our health care system. We believe our constituents should not be punished for wrongdoing committed by Congressional Democrats and the President -- providing American subsidies that are illegal." Of course, Republicans have been vowing to unveil such a transitional plan for many months. The promise to create a long-term Obamacare alternative dates back years. They've yet to deliver either -- and even their "transitional" plans would undermine the law, causing premiums to increase and depriving many millions of health insurance they could get with the law fully in place. Republicans might act differently if they start hearing from millions of angry constituents, but for the moment, such pressure -- like a court ruling against the law -- remains purely hypothetical. HuffPost Infographics by Alissa Scheller.